A thought piece inspired by the work of Sally Cairns, Phil Goodwin, David Metz and others. I will also be gathering together and sharing material about ‘disappearing traffic’, as I get time. The 2002 letter confirmed senior transport academics supported both investment and, most importantly, ‘priority allocation of road space’ for public transport, walking and cycling. Without ‘active policy intervention to manage the demand for road space’, they warned, government hopes for changes towards more sustainable travel behaviour would be dashed. And they were right, as was Colin Buchanan when he warned in Traffic in Towns that historic town centres are not compatible with mass motorised urban mobility. But again, policy muddled along. It failed to change inherited priorities, structures, and funding that continued to favour motorised transport. In the decade that followed the Professors’ Letter, national spend on cycling never got anywhere near the £10-£25 per head that experts recommend, while most cycle infrastructure built illustrated well the underlying assumption that cycle provision must never, ever, get in the way of important traffic. Official government committees have also provided evidence for a change in approach. SACTRA’s (the Standing Advisory Committee on Trunk Road Assessment) 1994 report ‘Trunk Roads and the Generation of Traffic’ established that the ‘induced traffic’ phenomenon (that building new road capacity generates more motor vehicle trips) was real and important. As David Metz has argued, improving capacity on ‘strategic’ roads like the M25 has often just encouraged short car trips within the local area, which in turn leads to the new capacity filling up, and longer distance traffic being delayed again. Congestion continues – with many other, arguably more important, problems (air pollution, noise pollution, severance, road danger) worsened. Yet despite academics, and many practitioners, agreeing that building or widening roads is an expensive and often ineffective solution to congestion, ‘predict and provide’ (predict demand for roads, provide the capacity) continues, even if lip service is paid to sustainable transport. Against all evidence to the contrary, politicians still want to promise that building new roads, or widening existing ones, will ‘clear bottlenecks’ and ‘reduce congestion’. And unfortunately many of the tools still used in transport policy-making still support this position, forecasting incredible benefit-cost ratios for road schemes that in theory save thousands of motorists seconds on their journeys. Key concepts have failed to make their way into policy and practice, into the tools and models that are used to justify investment. In the UK, this is despite the example of the capital city in which our Parliament is based. 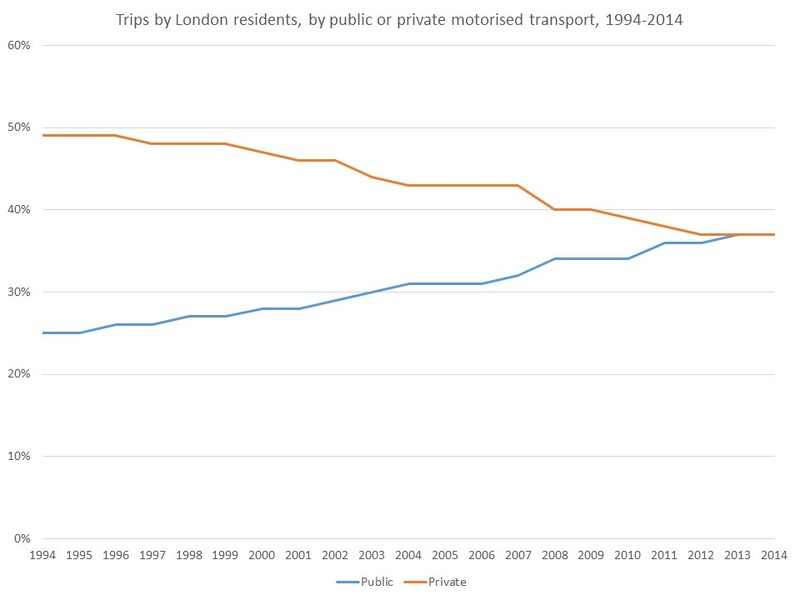 London’s transport system has many problems, not least from a cycling perspective: but the major and continuing shift away from the car towards more sustainable modes is a fantastic achievement and shows that change is possible. On to ‘Disappearing Traffic’. 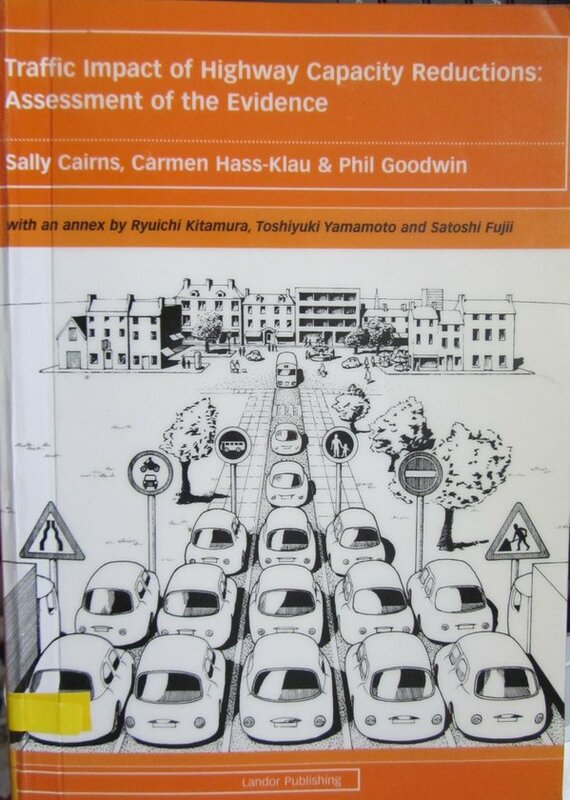 I have recently got hold of a copy of Sally Cairns, Carmen Hass-Klau, and Phil Goodwin’s 1998 report ‘Traffic Impact of Highway Capacity Reductions: a review of the evidence’. (A follow-up article from 2002 can be seen here.) This evidence review is the companion to the SACTRA report, in that it examines cases where road capacity was taken away. This is important, because often schemes to improve walking, cycling or public transport, or to improve public realm and residential areas, will involve doing just this. While the SACTRA report showed that building new roads often does generate new traffic, the Cairns et al report – using a series of detailed case studies of road capacity reductions from across the world – showed the converse to be true. Case-by-case outcomes vary substantially, but in many cases, when you reduce road capacity, existing motor traffic doesn’t all just find another route. Some of it ‘disappears’, or ‘evaporates’. This is still anathema to many people, despite all the evidence. Traffic ‘disappears’ or ‘evaporates’? How can that happen? It sounds odd because it doesn’t fit with the concepts we’ve inherited (including the concept of traffic itself), which as Naess et al write, still dominate the way that people think about motor traffic. The roots of transport as a discipline and policy area lie in engineering and economics. From the engineering side, we got the model of traffic as basically like water flowing down through a series of interlinked pipes. If one pipe is blocked, the water will follow a different route. Flow continues, it just diverts. That concept shaped the development of transport modelling – which has assumed that basically, use of cars was externally determined: in the National Transport Model, by oil prices, incomes, and population. More people, with higher incomes, will lead to more car trips – better sort out some roads to deal with them now! (Incidentally, the extreme difficulty of doing that in London has pushed TfL to seek to improve provision for other modes; although also leading to some very odd tunnelling fantasies). Of course, we should know, thanks to SACTRA and others, that building those new roads will most likely lead to more car use, and thanks to Cairns et al that alternatives are possible. However, the old paradigm persists and makes it hard for many people (including politicians and officers) to think differently. This is compounded by the dominance in the UK of trip-based modelling, rather than activity-based modelling. Our models inherently prioritise vehicle movement, not what people are actually trying to do. This feeds through into everyday understandings of how our roads work. Yet ‘traffic’ does not consist of millions of vehicles appearing as if by magic every day, each taking the quickest route to its destination. ‘Traffic’ (of all types) is a result of you and I, making decisions – often without much in the way of ‘rational choice’, based heavily on habit and under time pressure – about where, when and how we carry out daily activities. Much of these activities and associated travel (or not) are subject to change, over short, medium, and long term; and this is influenced by policy and provision. One longer term example. People’s places of work tend to be fixed over the medium term. So we can’t simply up and decide to work somewhere else. Those destinations are not discretionary in the way that a trip to a particular cinema might be. Their timings also are more constrained than other trips. However, over time, people react to changes in transport availability, experiences and costs affecting their journey to work. When we next move house, for example, we are likely to take those changes into account. Or, we might find that these changes make jobs in other areas available (or not) to us. This may then affect our employment choices in future (and obviously, some people are much more constrained in choice of home and job location than others). Also in the longer-term, changes to transport systems can affect demand for services, which can change service provision, with feedback impacts on travel and on demand for transport. In much of the UK, the built environment has become designed around the assumption that everyone drives. I’m lucky that I can buy decent fresh fruit and veg from ten shops within a ten minute walk. I have family and friends whose only option is a supermarket, where nipping in for a loaf of bread makes no sense, because you have to trek through a massive car park and queue for ages. No wonder they drive, and do a ‘big shop’ so they don’t have to come back for a week or two. But this can change – and is changing. Supermarket chains have noted the re-densification of cities, and the associated demand for local shopping, and have been opening smaller stores in urban areas. A shorter term example. Studies of disruptions shed fascinating light on the extent to which people regularly make poor transport choices; we get in the habit of travelling one way and going certain places, and just don’t consider alternatives. Oxford University academics looked at Tube strikes in London, and found that some commuters discovered a better route using parts of the public transport network that were still running, developing new travel habits which continued after the strike ended. Overall the study found a welfare gain for travellers, due to strikes, because of this. While we moan about disruptions, and they do cause pain, we sometimes benefit from the learning and change that they necessitate. Disruptions can change destinations and activity patterns, sometimes in the longer term. For example, people may start using local shops more, if it’s harder to get to their usual (further afield) destination. This can then help to support the local economy and encourage more shops to open, increasing retail vitality. In other cases the results of disruption can be more negative. But disruptions show that for many people there is substantial flexibility over where, when, and how we carry out our daily activities. Sometimes, we don’t even need to travel: some activities can be carried out at home or remotely via the internet. So why do we assume that trips are fixed, that whatever happens these vehicles will all carry on piling onto the streets every day, searching out their destinations with the ruthlessness of a Terminator? I think it’s part of the way in which we see ‘Traffic’ as something aside from people, something external that just happens and will carry on happening. Like the way in which ‘cars’ do things, rather than people in cars. But traffic is a result of people’s behaviour in constrained systems. It’s not external to us. Where road capacity declines, some people will need to, or choose to, continue making the same journeys even if they take longer, at least initially. But many motorised trips could change. Across the country, people make on average five short (under 2 miles) car trips every week. Between 32% and 41% of people say they could just as easily walk, cycle, or take the bus, for these trips. In London TfL have calculated that over a million trips currently made by car in the capital, each day, are potentially cycleable (under some fairly conservative assumptions). When things change, sometimes, it can prompt our long-established routines to change as well. I remember an academic telling me that he couldn’t walk or cycle to work because he had to carry heavy items: a laptop, books, marking and papers. He changed his travel behaviour after the introduction of income-linked car parking charges on his campus. While he could afford to pay, he didn’t like it and feeling annoyed, decided to avoid the charge. Once travelling without a car, he found that carrying his laptop, books, marking and papers to and from work every day wasn’t really necessary. He’d got used to throwing them in the back of the car – but when he couldn’t do that, a small change in work routine was fine. Disappearing traffic isn’t magic. It’s people, deciding to try cycling or walking, or public transport, because those options have become relatively more attractive than driving. Or people thinking maybe they could try going to different shops, or order something to be delivered. That perhaps they can’t be bothered to drive out and buy that newspaper after all. That possibly they should combine two destinations at the weekend rather than make separate trips. And a whole host of longer-term decisions, influenced by what kinds of things we might want to do, where and when. Many trips don’t change when a car journey becomes a little more difficult – but some will. All these decisions then affect other people’s journeys, and the choices that those other people make, which all then affect the policy and infrastructural changes that will be possible down the line (or not), and the choices business owners and developers make, and then what individuals choose to do in response to what policy does and where services are. Transport is a dynamic system where an apparent stability hides a constant state of flux. This is why, as Cairns et al point out, it’s very difficult to predict the impact a specific scheme will have on ‘traffic’; the extent to which people will shift modes, and/or change trips, timings, activities and destinations. However, the case studies collated in their report do strongly suggest that reducing road capacity will lead to some level of traffic evaporation (for want of a better name). It’s a hopeful message: and one that needs to be heard. 9 Responses to Disappearing traffic? We saw the same with a controlled parking zone, despite the Council expectation of revenue (which they are not allowed to profit from) that saw parking bays show horned in – often to ridiculous lengths, the result has been the streets almost deserted evenings and weekends, with plenty of tarmac which could revert to green space to the benefit of the local area. Much of the discussion seems to assume that government traffic policy, and public attitudes to private motoring, just come out of nowhere, through some sort of article of faith. Have you done any research into the proposition that in fact influential commercial forces drive these attitudes? I wouldn’t go as far as suggesting that there is some kind of conspiracy going on here, but the auto industry – manufacturers, oil companies, insurers, service providers – have a significant vested interest in expanding demand, and so,supply, of private motoring. There is an almost universally accepted assumption that businesses must grow, or die. In my own work, in corporate finance, I see how the valuation of a business, normally founded on multiples of “EBITDA” (earnings before interest, taxation, depreciation and amortisation) attribute higher value where management projections of earnings show a strong upward trend – quite simply, a growing business is worth more even if it is no more profitable than another, if it appears that it’s profits will grow faster. In effect, the auto industry is holding a tiger by the tail. It is driven almost obsessively to protect its current franchise, and to grow it as fast as possible. Few in the sector consider the possibility of changing their offering, say from oil to solar/wind energy, although decades ago we saw how the world’s dominant computer company, almost went extinct until it saw the light and moved away from the mainframe towards the PC. Hi Paul, I agree that’s an important part of the picture. I do think the impact of tools / data collection / paradigms / discourses matters too (but I suppose I would!) and that once the car becomes ensconced in the city, it becomes hard to roll this back (even e.g. in CPN). So I’d say it’s a mixture of factors. There is an interesting paper on industry influence from a public health perspective here entitled ‘Are Cars the new Tobacco?‘. I’ve co-written a couple of related papers a few years back, one a study of European scrappage schemes, and one a more theoretical piece entitled Cars, corporations, and commodities. Paul M – I completely agree with your points on the underlying growth assumption for justifying road construction as a major driving force for the policy towards building more roads and having all roads ‘open to business’ for cars. I agree with you Rachel that so much of transport behaviour is dynamic and hightly influenced by spatial planning. Also agree that the tools of modelling and CBA need reworking to include induced traffic (The main Danish national model now includes it) and focus more on a new paradigm based around mobility management. However, for as long as we have the underlying assumption (for which their is evidence against) that time savings should be the basis for our cost-benefit analysis and that we weigh this benefit so highly that it makes the environmental costs look like peanuts in comparison, it will always look like an attractive use of public money. I would say that this is the main element that needs looking at in order to really dismantle the paradigm. Forecasting is inherently biased towards pushing past trends into the future, at some point we need to decide what we want in the future and then plan around that. The problem is that we want economic growth and have linked roads to creating that through the design of our tools. Interesting article, thanks. Any views on what the negative elasticity figures are for reducing capacity, and what might affect them? The reduced capacity in London this year to build the new Cycle Superhighways (especially on Lower Thames Street) has caused persistent and significant additional delays on the A13 every morning. I don’t know how much traffic has evaporated there. But, I’m going to be collating and reviewing work in the area so let’s see – I’d also like to try and get academics and practitioners together to help develop understanding of some of these issues – at least at a qualitative level – and what further research needs to be done. Thanks for this. I’m a Bristol City Councillor. The Tories are proposing to review the opening hours of bus lanes in Bristol on the grounds that they cause traffic congestion. I shall be arguing the exact opposite, using some of your points. Most traffic forecasting models assume that people will never change home or work location, and firms won’t relocate, in response to changes in the transport system.